Can you help to resolve this exception ? This error occurs when browsing my living application, which is using a custom layout. "USERNAME=walter.bates | org.bonitasoft.engine.persistence.SRetryableException: javax.persistence.PersistenceException: org.hibernate.exception.DataException: could not execute statement"
I'm using Bonita v7.5.2. Currently, everytime when I want to import BOS files from my team mates, it shows an error msg. 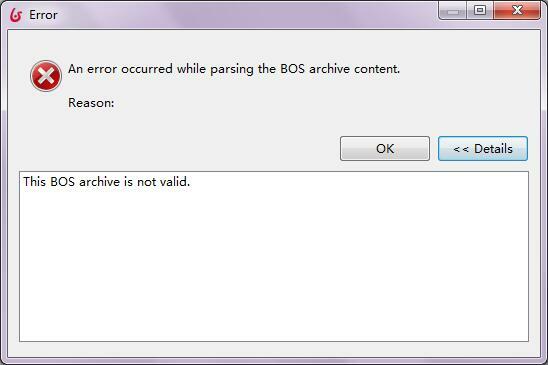 It says 'This BOS archive is not valid.' and didn't provide any other information. I'm facing a (new) problem trying to upload files in Google Chrome (versions 55 or 57, the same behavior). ARJUNA016053: Could not commit transaction. It is appearing the following error sometimes during the execution of some instances. Sometimes when I try to change the value of a attribute in a business variable, it throws the following error and the task stops. Please, how can I make the bonita engine to stop throwing this error? Read more about ARJUNA016053: Could not commit transaction. I recently started use Bonita BPM 7.3.1 on Windows 7 localy. I have a task, with stored procedure, I'll ask about it at another topic.